Combined 2nd Editions of Bushido and Gung Ho! Rising Sun (RS) is the long-awaited reprint/new edition of ASL’s PTO rules, combining the contents of Code of Bushido and Gung Ho! as well as incorporating additional material from elsewhere, notably the Gavatu-Tanambogo mini-HASL that originally appeared in ASL Annual ’93b. For many years, these rules have been out of print, depriving newer ASLers of the ability to delve into the PTO unless they were willing to pay an arm and a leg, or sometimes an arm and two legs, on the reseller market. 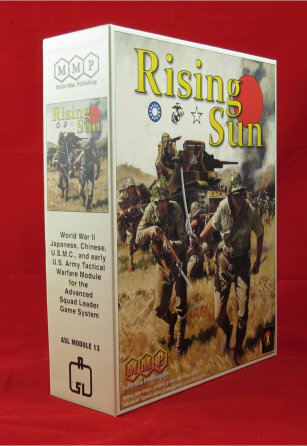 Of course, Rising Sun itself costs at least an arm and a kneecap, selling for $164 from MMP or around $135 from Internet retailers. However, it is loaded with components. 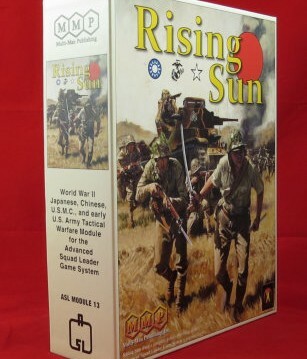 There are two ways to approach Rising Sun: 1) from the perspective of someone who does not have most or any of the PTO materials and 2) from the perspective of someone who has the earlier editions of this material and is considering updating. Let’s address the first perspective first. Both as history and as represented in ASL terms, the PTO is one of the most fascinating aspects of World War II. Some ASLers don’t care for the PTO because it is not typically vehicle-heavy or because they love the Germans, or because they have certain misconceptions about the PTO in ASL, such as that it consists mostly of scenarios involving amphibious landings or caves (actually, those constitute a tiny tiny minority of ASL PTO scenarios). However, they are missing a treat. In particular, the design of the Japanese in ASL is nothing short of brilliant. The designers created a nationality that operates fundamentally different from all other ASL units in some very key ways, yet is perfectly integrated into the overall ASL system. It is truly a remarkable achievement. Many ASLers enjoy playing the Japanese above all other nationalities (this author included) and it is easy to see why. This is not to say that Rising Sun or the ASL PTO rules do not have flaws. They do: several aspects of the PTO rules are over-designed, including the USMC, landing craft, beaches, caves, and arguably rice paddies and panjis. However, as few scenarios use any of these (except the USMC), this is not in practice much of a problem. In short, every ASLer should absolutely get Rising Sun and explore the PTO. Not to do so would be to miss out on a major part of the ASL experience. What about those ASLers who have the earlier versions of this material? Is there any reason to get the new version? In short, yes, although there is no absolute need to. 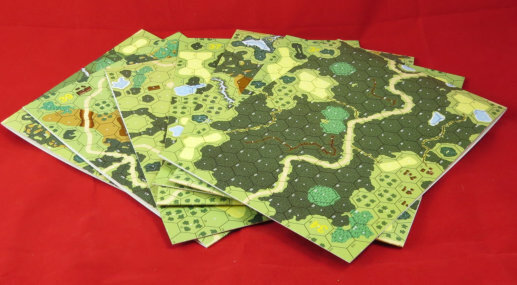 First, Rising Sun includes the unmounted, “new style” version of boards 34-39 and 47, and the only other way to acquire these boards is to purchase an entire map set directly from MMP. 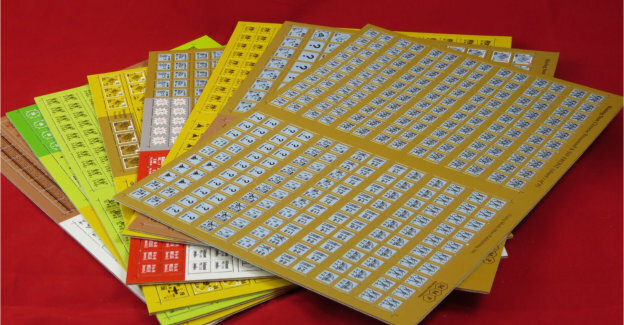 As all ASL boards now and in the future will appear in this format, acquiring the new versions will help you put together a complete set of all the new style boards. For cheapskates or fans of the original mounted boards, this may not be much of a reason. 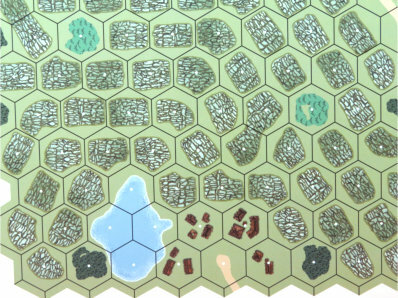 Incidentally, the overlays now have the new style artwork as well (the beaches and rice paddies in particular look better, though the paddies’ scale is still wrong). 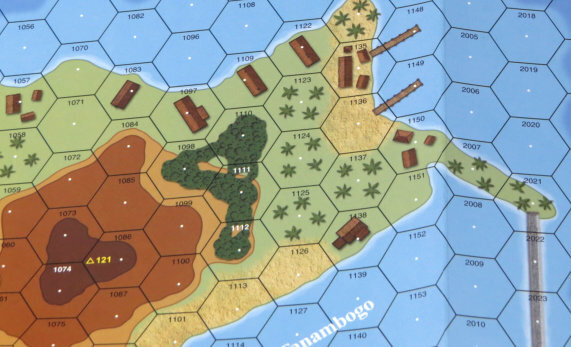 ASL veterans who enjoyed the Gavatu-Tanambogo mini-HASL that appeared in Annual 93b might be tempted to get Rising Sun because the module now includes an actual historical map of these islands (which originally had to be constructed out of various overlays). 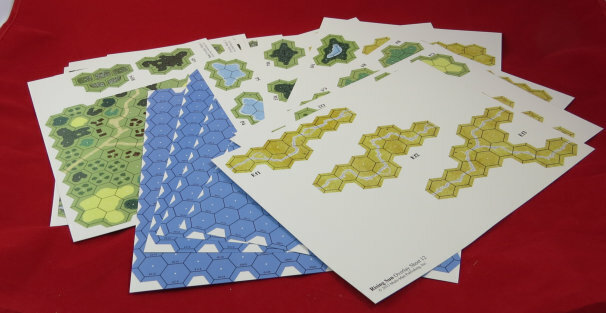 The map is attractive, though it is printed on glossy paper. 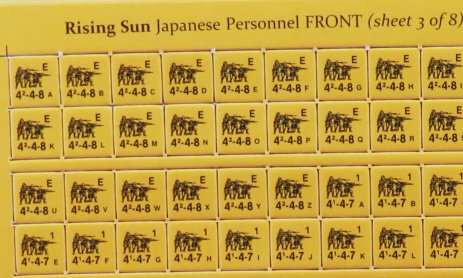 Another reason to get Rising Sun is the re-done counters, which are crisper, clearer, and more attractive than the original counters, and which have slightly larger type (though the type for AFV and Gun identification is still not large enough). However, this too is not necessarily a compelling reason. MMP did add some counters, basically throwing in the Marine Raider and Paramarine squads that appeared in Operation Watchtower (and which, considering their tiny size and brief existence, were not worth including at all), as well as a new U.S. 2-6 LMG that costs 2pp instead of 1pp (so now, not only will players have to search forever to find the damn U.S. LMG they needed, when they find one it will invariably be the one with the wrong PP). Sadly, one very useful counter which they did NOT incorporate was the Jungle Debris counter that debuted in the Suicide Creek HASL in ASL Journal #9. A third reason to upgrade is that errata has been incorporated into the scenarios. 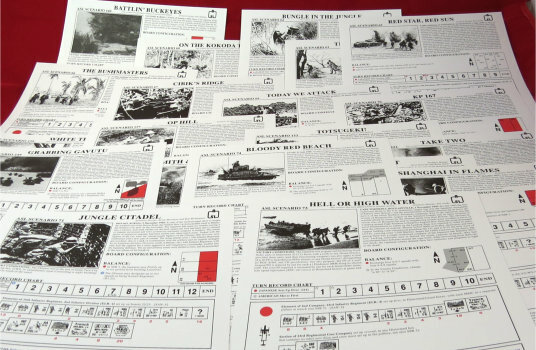 The scenario mix now includes all the original scenarios from Code of Bushido, Gung Ho, and Gavatu-Tonambogo, plus reprints of scenarios from The General, the ASL Annuals, Action Pack 2, and the ASL Journals. Most of the scenarios have been updated to redress errata or balance. Adding the additional scenarios is a nice touch, as they provide good play value (most are very good scenarios), get some old scenarios back into print, and allow the purchaser to have an “instant” PTO scenario collection. The only drawback is that, like the Code of Bushido and Gung Ho! scenarios themselves, most of the included scenarios are quite old and thus tend to be considerably larger and longer than the average scenario of today. Perhaps the most important reason to upgrade, though, is that the rules themselves are now 2nd Edition Rules. This means, first of all, that all relevant errata has ostensibly been incorporated into these rules, and second, the rules are in a more readable font. Moreover, the Chapter H pages now include the relevant “multi” notes references next to each vehicle, gun, or landing craft, so that players no longer have to flip back and consult a chart to find out which notes they need to reference. All this should not be underestimated. In any case, the appearance of Rising Sun, as delayed as it was, was a welcome event and hopefully many newer ASLers will be tempted thereby to venture into the jungles. A fully packed, heavily laden treasure chest of ASL. HOWEVER, MMP take heed of this: I am clipping my counters (not as I write this, pretty tricky thing to do) and have noticed something rather depressing. The cardboard used for the counters shows a massive disparity between those of the highly impressive BV and these of RS. Please bear with me as at the mo it looks like I’m some kind of OCD geek. As I clipped both counters there is a different sound due to the density of BV counters compared to the RS. I looked at the sides of the punched counters. They look different. The compressed cardboard used in the RS looks much more grainy. If I had to weigh 10 KG of the BV counters I am more than certain that I would have to add about 30 – 40% more RS counters to reach the same weight. So what? Well it means that the shelf/counter tray life of our OOB is going to be greatly diminished. I can already see the counter binding (I’m no technician) looks like it is on the verge of lifting. I had two counter face separations just with the Japanese. Not good. So either MMP is using less cardboard or a cheaper grade. Needless to say I will need to ask around fellow players to get their views and I would kindly ask MMP to look into this and to make any possible adjustments where needed. 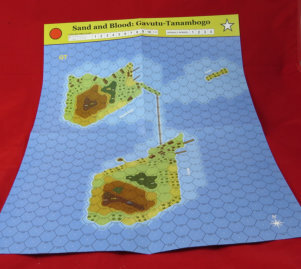 Ps The mapboards no probs, great as usual, the GT map sheet is excellent and the overlays are also very good. Basically it’s just the counters. 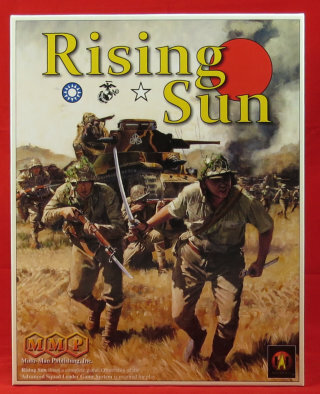 Is the Rising Sun still in print?